In Waters of Nereus, you direct a crew of seafarers on Nereus, an amazing world of vast oceans with highly valued treasures. Sail your ship through the waters, plumbing the oceans for treasures to pay off your crew. The game occurs over 4 "days." 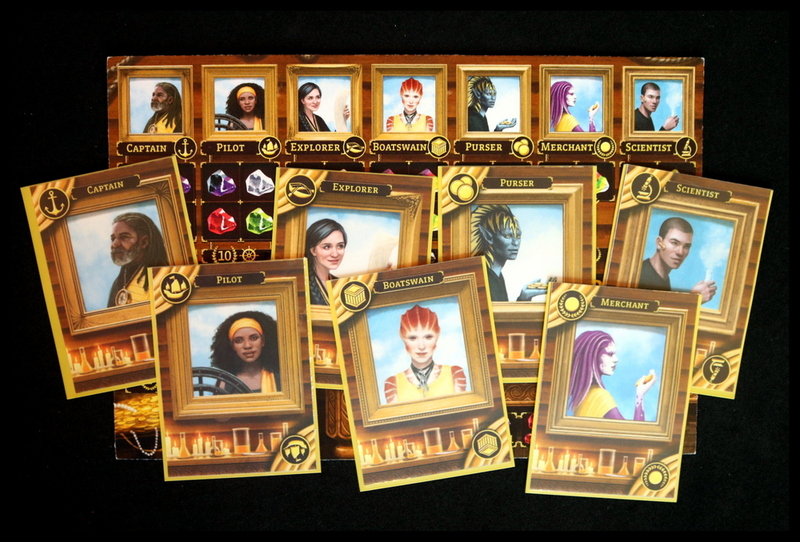 On each day, players choose 4 of their crew cards, one at a time, and performs the crew member's actions. The crew members perform a variety of tasks, such as sailing the ship, picking up treasures, providing income, converting gold to victory points, and more. 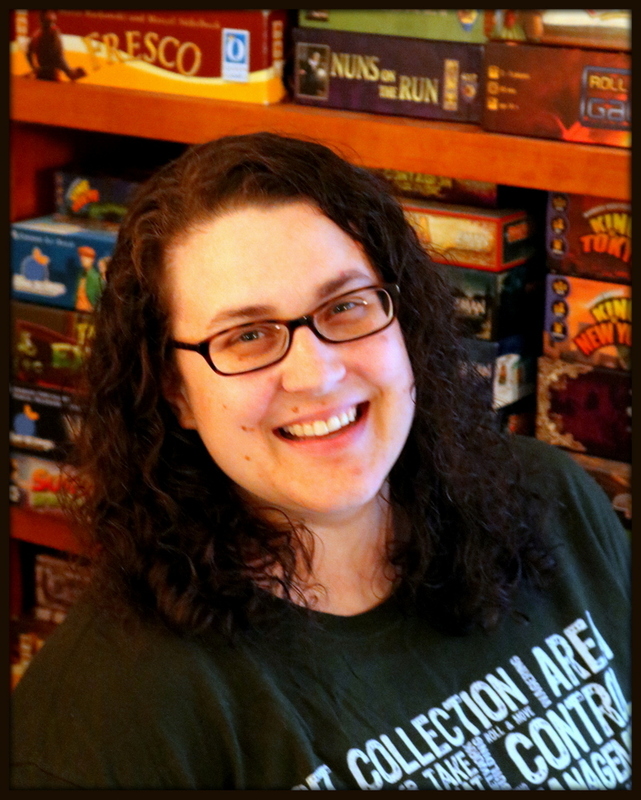 The game is beautifully illustrated by Beth Sobel, one of the most talented illustrators in the business. WARNING: This is a preview of Waters of Nereus. All components and rules are prototype and subject to change. Waters of Nereus is coming to Kickstarter in September 2018. In the gorgeous world of Waters of Nereus, you are controlling the seven-member crew of a ship in the hopes of collecting the most treasure by the end of four days. Although we played with a prototype copy, the completed art is rich and drew us into a new world with a multiracial crew--and by that, I mean not only a good variety of human races, but several new alien races as well, and a range of genders represented in all the crew roles. The images of beautiful alien and human figures juxtaposed with old-fashioned candles and wooden chests with the goal of plundering jewels and gold takes you to a semi-fantasy, semi-pirate world that is well worth exploring. 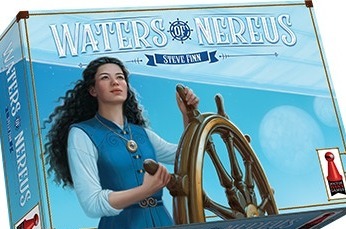 Waters of Nereus features a twist on the role-selection mechanic that lets you explore the abilities of the seven members of your crew, a twist on area-movement that pushes you to navigate your ship to pick up gems, and a twist on set-collection that encourages you to use these gems to fill up different areas of the cabin of your ship to earn new abilities and the ever-important victory points which can lead you to having the most successful crew and the greatest glory in the end. Waters of Nereus contains a variety of components: at the heart of the game are four cabin boards and four matching decks of crew cards--one set for each player. Here is where you'll find the captivating Beth Sobel illustrations of the diverse crew and the candlelit cabin with its scientific equipment. In the center of the table, you'll place the double-sided game board--one side for 1-3 players and the other side for a full four-player game. 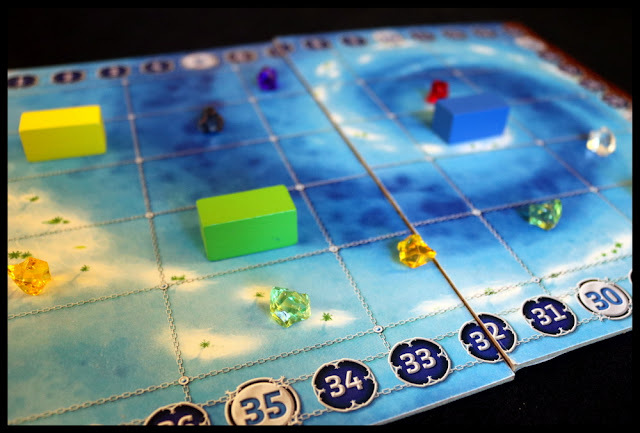 This game board will be home to your ships, action markers, and scoring discs, as well as the waters themselves which will hold some of the 96 treasures, with more added each round according to the discovery cards. 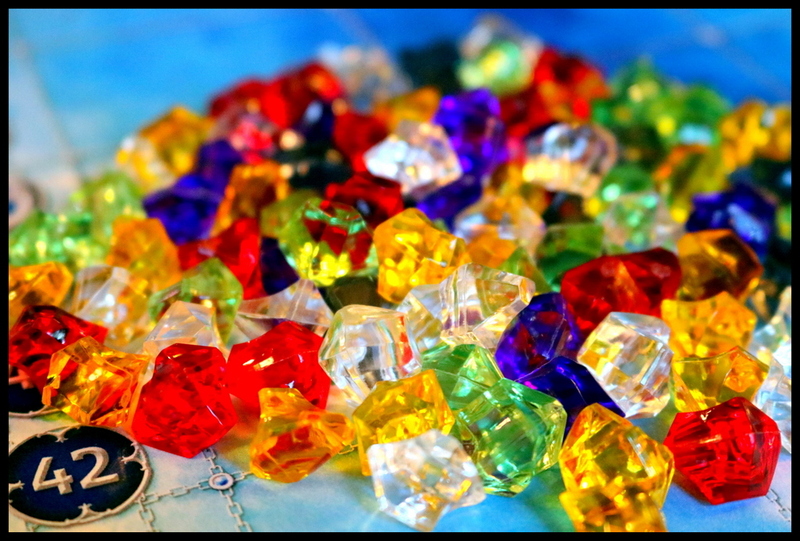 The treasures are currently colorful plastic gems--and the color does matter as the game progresses! 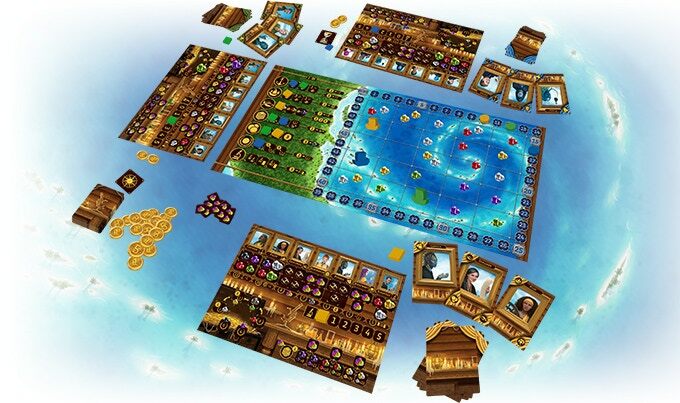 The rules indicate that there will also be cardboard treasure tokens with letters on them and that the cabin boards will be double sided, one side with letters, to make the game playable by colorblind players. I appreciate the effort here to include players with vision differences right from the beginning. In addition, there are coins, wild gem tokens, completion tokens (to indicate when your crew members have all the gems they need), an hourglass token to track the actions in the action phase, and a sun token to track the days. A die and a compass card are also included for the two player variant, and there will be a goal board for a solo variant as well. 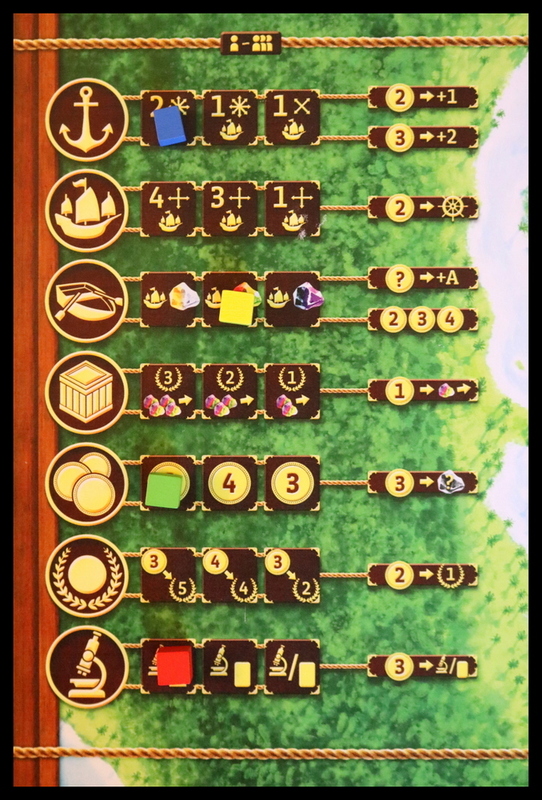 Setting up does take a bit of time as you sift through the components for the first time, but with each play it becomes faster, since each player gets a cabin, crew deck, and wooden markers of their own color and can set up simultaneously. Waters of Nereus is, at heart, a game about making decisions based on the abilities of your crew, the position of your ship in the water, and the gems you already have in your ship. It brings some interesting twists to the role-selection mechanic that our group hadn't seen before, and was the captivating type of game that made us want to play again immediately to delve more deeply into the mechanics and decisions laid before us. Broadly, the events of Waters of Nereus take place over the course of four Days. Each Day has four Phases--the Discovery Phase in which new gems are added to the water; the Action Phase, which is the meat of the game as you choose crew members and use their abilities; the Explorer Phase, which gives one extra action to players who used their Explorer that day; and the Conclude Phase, which is when you clean up the board and get ready for the next Day. 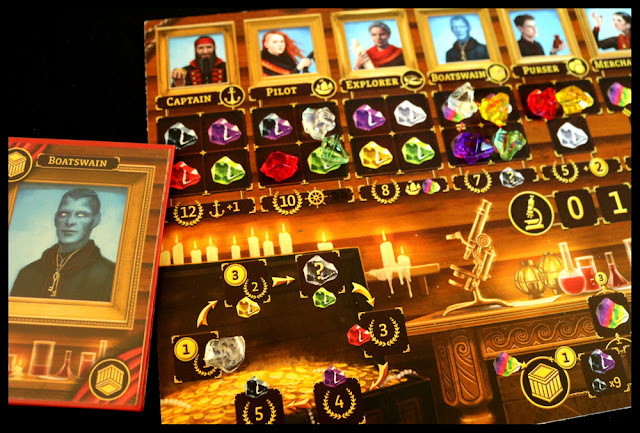 During the Action Phase, each player will simultaneously choose one member of their crew from their crew deck: Captain, Pilot, Explorer, Boatswain, Purser, Merchant, or Scientist. 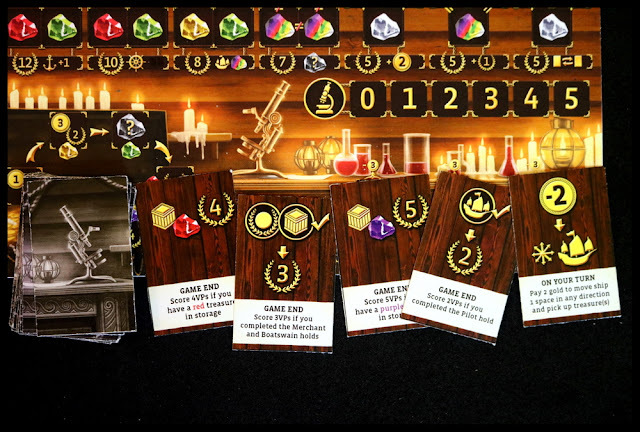 Starting with the player who has the hourglass, you will take turns to place one of your action markers on the board in one of the spaces next to that crew member's symbol. The icons on the board are clear and easy to understand once you've read the rules for each crew member. The available actions are slightly different, so there's an advantage to being the first one to choose a particular crew member. At the same time, you may want to complete actions in a certain order to get the most benefit. Do you play your Pilot first to get into a more beneficial spot from which to pick up gems, or do you use the Explorer first to grab the colored gems that you really need? It lends itself to a deep and interesting strategy with a little bit of predicting the moves that your opponents will make. The Captain and the Pilot let you move your ship, and the Explorer lets you pick up gems that are adjacent to your ship. When you pick up gems, you put them in certain parts of the cabin--under the crew's portraits to allow you to enhance their abilities, in the treasure chest to earn victory points, or onto the storage area to be used later or turned into wild gems. The Boatswain will let you move gems around in the cabin once you've picked them up. The Purser brings you gold, and the Merchant turns gold into victory points. 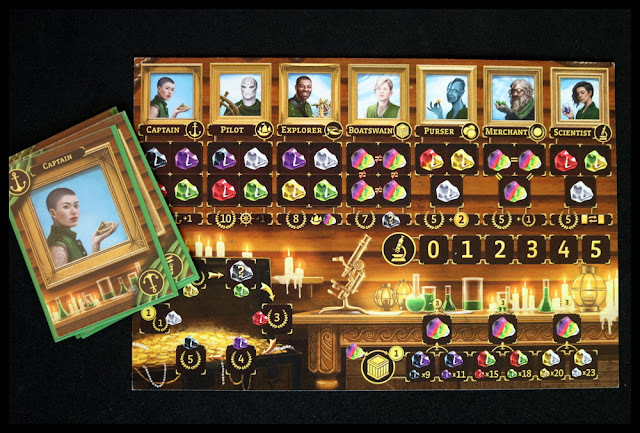 The Scientist performs research, which allows you to draw and play science cards that may give you an in-game special ability or an end-of-game set of bonus points. You'll continue playing (passing the hourglass) until each person has been able to select and use four of their seven crew members during the Action Phase. If you used your Explorer during the Action Phase, you'll get to pick up that action marker and choose a new crew member from your hand to play during the Explore Phase--it can be a big advantage to get the benefits of five crew members in a Day instead of just four. The roles are all important to your final victory, and it's an interesting puzzle to figure out who to use and when. In addition, once you fill up the slots under one role with the specific colors of gems, you not only gain victory points but also an enhanced ability that you can use every time you play that crew member for the rest of the game! Choosing which crew members to enhance first can be a vital part of your strategy, as gaining some advantages will make it easier to gain others. As in all good strategic games, though, there is not one single clear path to victory. 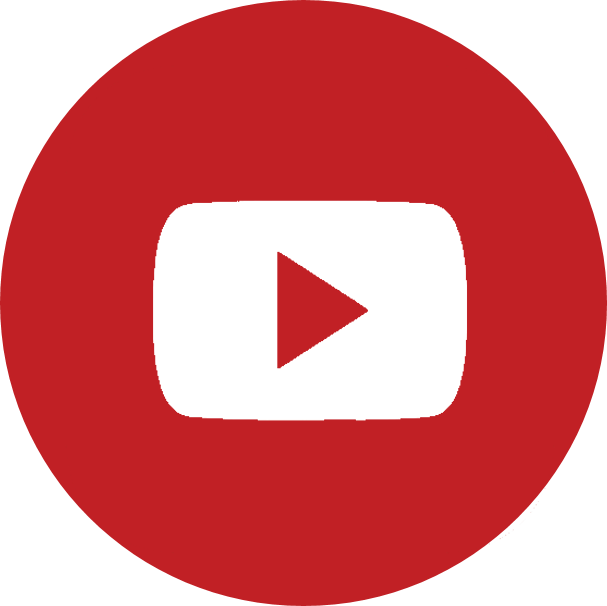 Each player and each game brings something new to the experience and although you may think that you know which crew members are best to use first, your plans may be foiled depending on the decisions of your opponents. After four Days have passed, you'll add any end-game victory points, and the player with the highest total wins! If you're like us, you'll start dissecting the game and rethinking certain decisions that turned out to be pivotal, sketching out strategies for the next time, and checking the clock to see if you have time to play another game. Even in its prototype form, when we opened the box for Waters of Nereus, we let out a collective gasp at the lovely artwork. 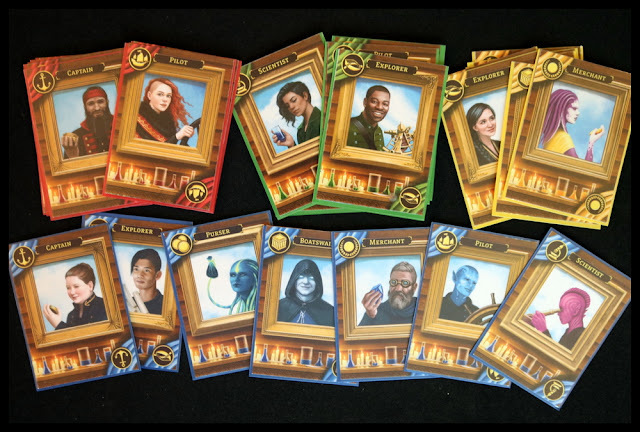 The details in the cabins help build up a theme of fantasy pirates, and the portraits of the crew (different on each player's cabin) are delightfully diverse across a range of races (both human and alien) and genders. The cabin boards stand apart as a magnificent piece of the game both structurally (holding many different aspects of gameplay) and visually. The decision making in Waters of Nereus is a very interesting balancing act between your personal goals (what do you think you'd like to accomplish first? ), the gems that appear on the board (can you get to the color you need? ), and the other players (she took the action spot I really needed!). Waters of Nereus hit a sweet spot for our group in that it has some depth of strategy available to play out over four Days but doesn't feel long at all. Most of our games clocked in at just under an hour, which is a good fit for us. The implied storyline here (Where are these aliens from? Why do all ships have a scientist on board? What sort of culture are we living in that blends the fantastic or futuristic with the old-world pirates?) is so thought-provoking. We'd love to have a little more included in the rules booklet that fleshed out this world a little more and gave us more ideas about what kind of history brought us to this place! Other than wishing for more of the story, our groups didn't have anything bad to say about Waters of Nereus in its prototype form. We're looking forward to seeing a finished copy of this game! 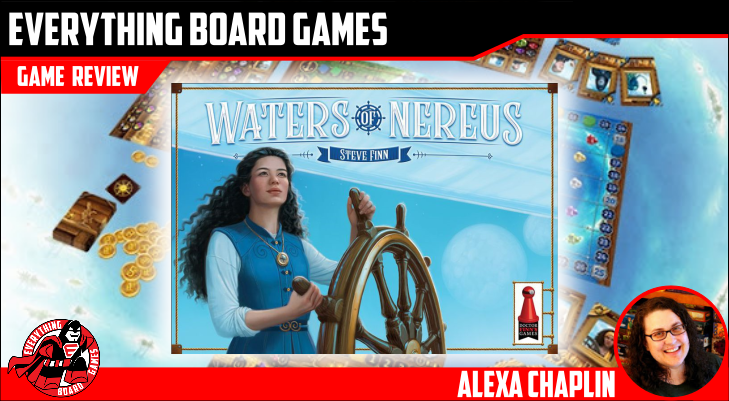 If your family or group enjoys middle weight, decision heavy, role-selection games from Vikings on Board to Puerto Rico, or enjoys sailing games like Pirate's Cove or Yamatai, you might enjoy Waters of Nereus. Waters of Nereus is a stunningly beautiful, intriguingly different, richly layered game that combines role selection, area movement, and set collection into one thoughtful, highly replayable experience. We look forward to seeing the designer's progress on Kickstarter and hope that there is even more world-building to come around the diverse characters and situations. Thanks Alexa for previewing the game! For those interested, I am planning on launching the Kickstarter in late September, around 28-29th. 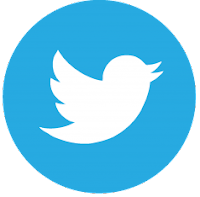 To stay informed, please visit https://www.doctorfinns.com/blog/ and sign up for the email list. We will add the KS link once you go live.